Dr. Rachel Chung, Associate Professor of Business and Coordinator of the MIS/Analytics majors at Chatham University, works on fundamental issues in Knowledge Management Systems and Cybersecurity, to data analytics applications to fraud prevention. Dr. Chung has published in top journals including Communications of the ACM, Journal of Managerial Psychology, International Journal of Production Economics, Journal of Information & Knowledge Management, and Omega. She has also given numerous presentations at international conferences, including International Conferences on Information Systems (ICIS) and Academy of Management (AOM). Dr. Chung is highly engaged in the Information Systems community. She has served as associate editor for the European Conferences on Information Systems (ECIS), guest associate editor for the Omega journal, and as ad hoc reviewer for numerous journals, including MIS Quarterly (MISQ), Data Base, and Small Group Research. 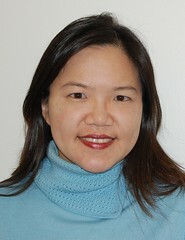 She has also served as reviewer for all major Information Systems conferences, including ICIS, AMCIS, PACIS, and ECIS. In 2016, Dr. Chung received an IBM Faculty Award in the Cognitive Computing category. In 2018, Dr. Chung served as a visiting scholar at Vietnam National University – International School and taught enterprise analytics, and relational database management. In 2019, Dr. Chung was invited to join the Advisory Board of the NSF-funded project on Big Data Education at Penn State University. In 2012 Dr. Chung received a $10,000 research grant from the Institute of Fraud Prevention (IFP) for her research study on the genetic basis for Internet fraud detection with Professor Dennis Galletta of the University of Pittsburgh, and a BBC World News interview about this research study. In 2013, the project is funded as a signature project by the Grace Ann Geibel Institute for Social Justice and Responsibility. In 2013, Dr. Chung received another $10,000 research grant from the Institute of Fraud Prevention (IFP) for her research study on the genetic basis for deception detection with Professor Chih-Chen Lee of Northern Illinois University. Professor Chung also received IFP’s support for a global fraud research project with Professor Chih-Chen Lee of Northern Illinois University. In 2018, Dr. Chung received a $50,000 National Security Agency subcontract with Dr. Stephanie Rosenthal for the application of reinforcement learning to cybersecurity investigation. In addition to academic research, Dr. Chung is also very involved in the application of scientific research methods to solving business problems. Her business students have engaged in over twenty client projects with executives from City of Pittsburgh, WQED, AllFacilities Energy Group, Ardex Americas, TingWall, Coca Cola, and other organizations. At Chatham University, Dr. Chung advises the MIS/DSA Student Club, and the Women in Cybersecurity Club. Dr. Chung also served as the founding faculty sponsor of Computer Science Teacher Association (CSTA) Pittsburgh. To support evidence-based decision making, and scientific thinking in general, Dr. Chung has served as Grant Awards judge for the 2012, 2015, and 2018 Intel International Science and Engineering Fair (ISEF) and judge for the 2013 Pittsburgh Regional Science and Engineering Fair (PRSEF). Since 2018, Dr. Chung also serves on the Community Advisory Board of WQED, a Public Broadcasting Service (PBS) member television station licensed to Pittsburgh, Pennsylvania, United States. Dr. Chung is member of Association of Information Systems and Association of Computing Machinery. Dr. Chung was born and raised in Taiwan, and is a native speaker of Mandarin Chinese. Professor Chung moved to Pittsburgh, PA, on a full scholarship to the PhD Program in the Psychology Department at the University of Pittsburgh, after completing a Bachelors of Science degree in Psychology at National Taiwan University.